The Cottage at Seven Oaks Farm | A private country retreat in the verdant Shenandoah Valley of Virginia. A private country retreat in the verdant Shenandoah Valley of Virginia. For years I wanted a flock of backyard chickens. Then my son encouraged me to get a few about the same time the Southern Living issue with chicken house designs arrived, and the rest is history. We’re now the proud owner of ten laying hens. 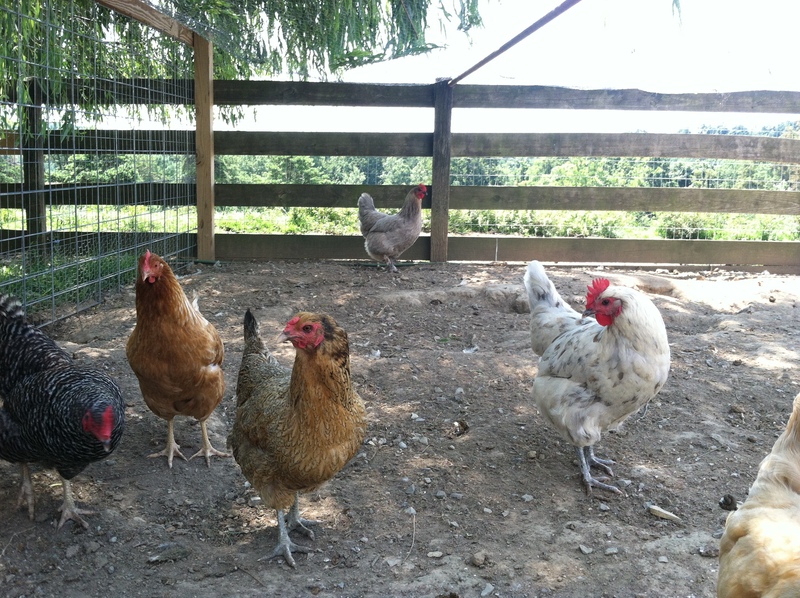 We have two each of the following breeds: Amercaunas (lay colored eggs – blue, green and pink); Marans – French hens – lay the darkest brown eggs of any chickens; Barred Rocks, a friendly black and white “speckled” hen; Red Stars – a little lighter in color than Rhode Island Reds, and a bit more docile; and Buff Orpingtons – great layers with very friendly dispositions. We did a little research then selected a reputable breeder several hours from here to be sure we started our flock with healthy chicks hand selected for their dispositional qualities as well as egg production. We also considered many different coops but decided on a nice little red hen house with metal roof for the hens to enjoy during a gentle rain. We have given our girls about 500 sq ft of confined roaming space but netted the top to keep predators like red tailed hawks and barn owls from from “dining” on our hens. With ten layers we should yield about five to six dozen eggs per week. What to do with six dozen eggs per week? 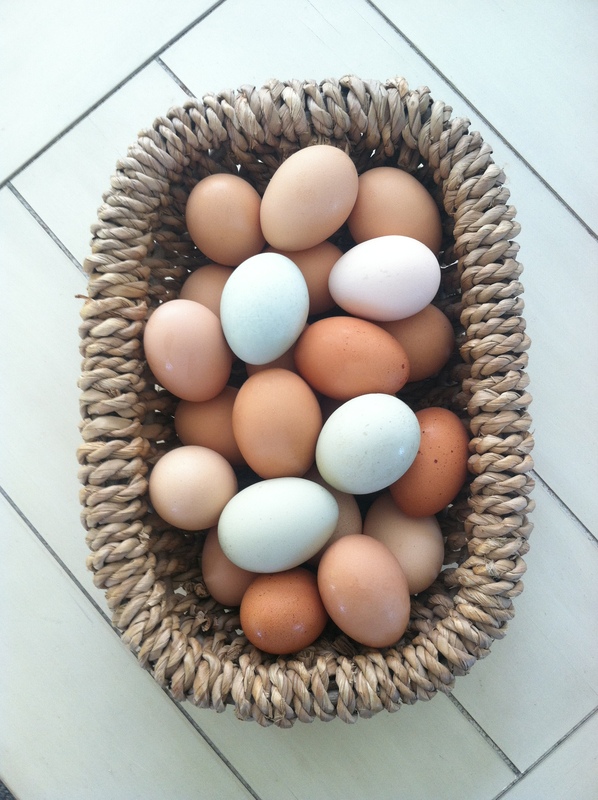 We have all of the fresh eggs we can use and share with family and friends. We’ve even shared with guests in the cottage from time to time. By the way, the color of the shell does not affect the taste of the egg. Commercial chickens generally lay eggs for about a year and then go to market for meat. Backyard chickens can lay two years or so and then are often replaced with younger birds. On a recent trip to the Biltmore Estate in Asheville, NC we learned from their flock manager that they have known hens to lay as long as ten years! That was great news as our girls will have life rights at this farm and never see the inside of a stew pot!! 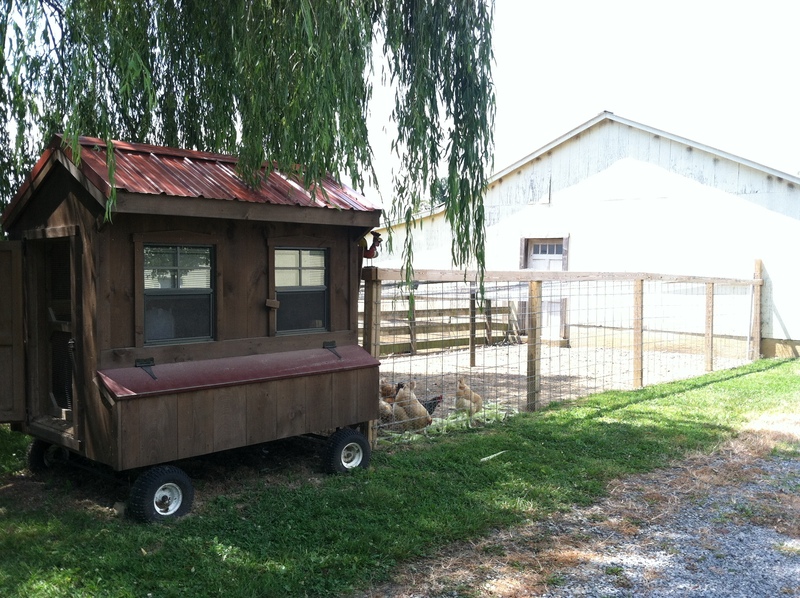 Come stay with us and meet the chickens and many other friendly critters on the farm! Spring is in bloom on the farm . . .
Like most places in the country, we have had a pretty mild winter and spring has arrived earlier than usual, or so it seems. The dogwoods are in full bloom, the garden is awaiting to be planted with early vegetables and the cottage is ready for your visit. This is a favorite time of the year when the outdoors wakes up with the sounds of tree frogs, assorted song birds, and of course, the donkeys. We are in the midst of lambing season, so we now have about 10 tiny baby lambs in the barn with their mothers, waiting to go out in the sunny pastures. Spring is a wonderful time to visit Virginia and spend some restful and peaceful time on the farm. At last, the Cottage at Seven Oaks Farm is open for guests! Please take a look at the pages to the right to learn more about the Cottage at Seven Oaks Farm. View down the lane from in front of the main house. Winter at Seven Oaks Farm.